Big news for grassroots football teams from our official kit partners, Genesis Sports. The official licensee for PUMA team-wear in the UK and Ireland has announced additions to the 2016/17 PUMA team-wear collection, with over 90 new lines introduced. 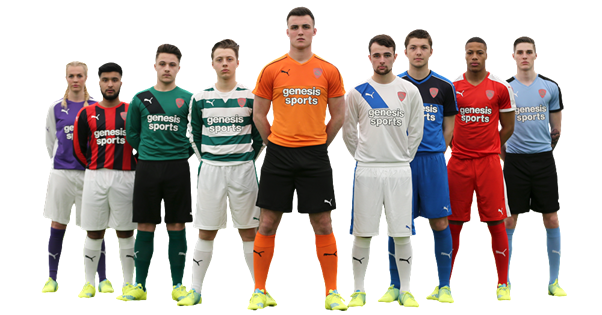 Genesis Sports supply over 20 of the UK’s professional football clubs with PUMA kit and training wear. This includes recently crowned Premier League champions Leicester City, Championship winners Burnley, Wolverhampton Wanderers and Heart of Midlothian. Since 2015, Genesis Sports also provide PUMA football kit and team-wear to over 1,000 non-league and grassroots football clubs in the UK and Ireland. The new PUMA 2016/17 team-wear collection sees the introduction of a new outfield playing kit, two new goalkeeper ranges and two new training wear lines. Check out a selection below, or view the new ranges in full at genesissports.co.uk. PUMA have added a new outfield jersey 'Accuracy', which is available in 5 colour options in long and short sleeve. PUMA have added two new goalkeeper ranges – 'Triumphant' and 'Tournament' - both in striking new colour options and with matching shorts and socks available. And it doesn’t end there, as there are two new PUMA training wear ranges for 2016/17. Spirit II effectively replaces the outgoing Spirit range, while the new Veloce range is certain to prove a popular new addition to the range. The new ranges are in stock and available for clubs to buy online at genesissports.co.uk.